Boys registering for the Spring 6th and 5th teams will be assigned to one of three teams that compete in the "B" Division of the Southeastern Pennsylvania Youth Lacrosse Association ("SEPYLA"): B1, B2 or B3. The B1 team will be predominantly 6th graders, B2 will be a mix of 5th and 6th graders and the B3 team predominately 5th graders. The coaches will assign players based on experience and ability. First-time 6th graders should expect to be assigned eventually to the B2 grade team. Since these are travel teams, an additional fee of $20.00 has been added to the registration fee. Players who register by Black Friday, November 23 will receive their choice of a Swax ball or a pair of Optimist Lacrosse socks. Players must have a jersey and shorts. New players should purchase both when registering. Returning players may purchase a new jersey or shorts. 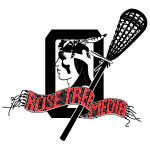 Check out this Lacrosse club team 'Spring 2019 Boys 5th Grade Lacrosse Team' with Rose Tree Media Optimist Sports!